Here are a few things that you should DO to ensure better delivery and interaction rates when using JangoMail (or any email service provider). 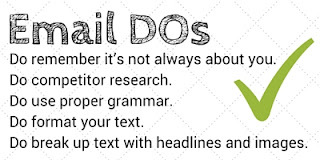 Wondering what the content of your emails should be? Test a variety of campaigns to see where your customers engage. Which campaigns are being opened? What links are being clicked? Use these results to create best practices for your business. Below are some content tips to help you get started. Do remember it’s not always about you: One big mistake we often see is businesses crafting the messages they would want to see, without taking into account the content their subscribers interact with the most. Try to tailor your message with the data you have about your clientele. Use the sales data, web analytics and reporting tools in JangoMail to determine what works best with your subscribers. This may mean that the content of your emails doesn’t align with your personal preferences, but it will be the content your subscribers want. Do competitor research: Check out your competitor’s website, subscribe to their emails and follow them on social media. There is always something to learn from what others in your industry are doing. Never copy someone else’s campaign, but feel free to learn from what your competitors are doing. Do use proper grammar: This should go without saying, but even the best of us make mistakes from time to time. Make sure to review your content with a fine-tooth comb. Cross all the T’s and dot those I’s. Use proper punctuation and make sure it all makes sense and your sentences are framed well. You can break grammar rules, but make sure it’s clear that the mistake was intentional rather than an oversight. For more tips check out Ryan's video below.